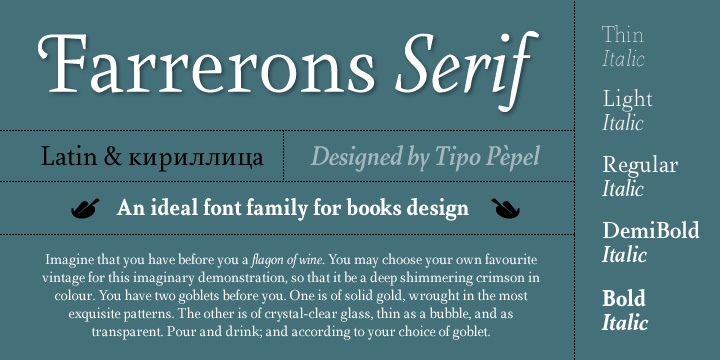 Farrerons Serif font is a perfect blend of the old Roman Trajan to the new mystic and impressive modern and futuristic fonts. Especially designed for the body type text, Farrerons Serif also gives a sleek feeling when used as heading or titles. It is a fully working OpenType font which has gained popularity because of its design for spacing and readability – sudden strokes and mixing of ancient to modern makes it a de facto for texts. It has full set of letters both caps and small, decorative characters and initials. The also has extened support for Central Europe and Cyrillic languages.